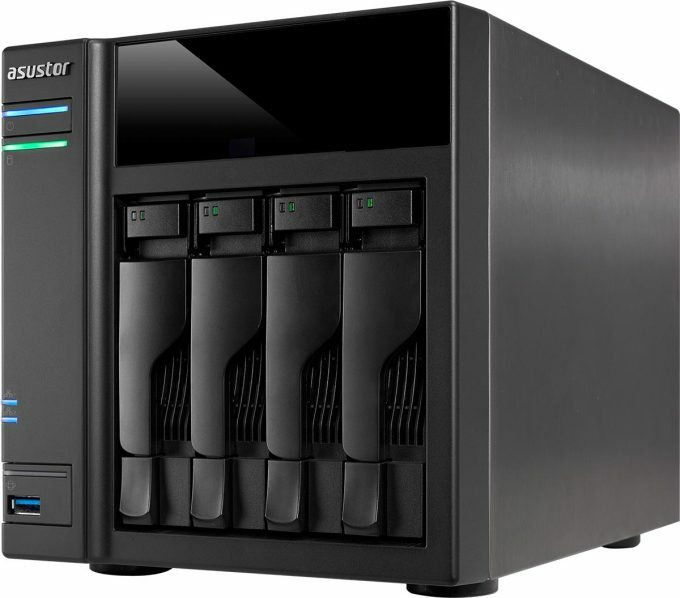 Since one can never have enough storage, under review today is a 4-bay NAS from ASUSTOR: AS6104T. Fitted with an Intel Braswell SoC, this x86 NAS has an incredible range of capabilities. Kodi and Plex support, coupled with an HDMI port, the ASUSTOR AS6104T could replace your Home Theatre PC while providing heaps of storage for the rest of the home. Let’s take a look! It’s been a little over a year and half since we last looked at anything from ASUSTOR. The now established NAS manufacturer had been fairly new when we first looked at its excellent AS-204TE, a NAS we were pleasantly surprised with. In the time between that review and today, the Taiwan based storage company has worked to define what can be done with a NAS in the home, through consistent and cadenced hardware releases and its extremely impressive app market. With products for the SMB market as well, ASUSTOR has the portfolio to satisfy most any need – short of the enterprise. Today, we are working with the ASUSTOR AS6104T, a four bay, dual NIC, Intel-powered NAS. In fact, the AS6104T was the first NAS on the market to feature Intel’s latest Braswell dual-core Celeron. Boasting 2GB of DDR3L (upgradeable to 8GB) and a maximum raw capacity of 32TB (8TB x 4), the AS6104T has everything we have come to expect from a NAS box, including plenty of third-party support in its app market. For those of you that saw our review of the AS204TE, the appearance of the AS6104T might look familiar. That’s because externally, the two are identical. Only on the back of the NAS do we depart from the similarities. Powered by an Intel Braswell Celeron N3050, the same CPU found in Jamie’s brilliant look at the Synology DS216+ a short time ago. With the N3050, ASUSTOR gives the AS6104T a 64-bit processor that runs at 1.6 – 2.16 GHz; this gives it both the heft to provide quick file services, but also power to run the multitude of third-party apps that fill the ASUSTOR app market. Beyond the CPU, the AS6104T offers a front facing USB 3.0 port for high-speed data transfers from an external drive, and plenty of I/O ports on the back. The AS6104T has a pair of gigabit NICs that can be bonded and set to whatever mode you want (of the seven available). Thanks, Donald Becker! For expandability, the AS6104T has you covered. Two eSATA ports, two USB 2.0 and two USB 3.0 ports allow for additional expansion of the NAS as well. The NAS itself, as mentioned earlier, is simple in appearance with four drive bays arranged horizontally across the bottom of the front. The drives sit vertically in their caddies, and each bay has status LEDs to view their status. One feature that has crept onto NAS boxes over the past year or two, and in my opinion the most important, is the addition of HDMI. The AS6104T comes with HDMI 1.4b and S/PDIF ports for multimedia out. These allow the user to connect the AS6104T to their home theater and let the NAS drive their multimedia experience. With the form factor of current NAS boxes, the need for a dedicated HTPC is waning. They certainly have their place, but I’d wager for the majority of users, a simple NAS will more than suffice. Add in its impressively large app market, and ASUSTOR makes as good a push into the living room as anyone on the market. At the heart of the ASUSTOR experience is its operating system, ADM. ASUSTOR has designed ADM to act and feel like the desktop environment on our computers. Clicking on an icon will open a window that can be moved around the screen and minimized, but for some reason, cannot be resized. The best feature of ADM is the ASUSTOR App Central. With close to 200 apps available, the uses of the ASUSTOR NAS are many. With an HDMI port built into the NAS, a personal favorite of mine is the Kodi app (Plex is additionally supported as well). Currently on “Jarvis” 16.0, the ASUSTOR developers take the code assembled by the Kodi team and modify it to ensure a stable experience for ASUSTOR users. Because of this, there will always be a lag behind the official Kodi release schedule. When XBMC evolved into Kodi, we saw the ASUSTOR team leave XBMC behind and begin to port Kodi for its NAS boxes. Another notable ability of the AS6104T, when connected to an HDTV, is the ability to play games. Through app central, a user can install emulators, allowing them to play their ROMs. I played around with this by using fceuxs to play a handful of NES games. With a connected wireless controller, this adds a tremendous amount of additional use to the already robust capabilities of the NAS. Finally, ASUSTOR has provided users with a simple and quick ability to take near instantaneous snapshots of iSCSI LUNs. For those that use iSCSI (it’s not difficult and something most users should consider), the ability to take a snapshot of any particular LUN, and then fall back to that snapshot in the event of data corruption is extremely nice. Additionally, like most NAS vendors today, ASUSTOR provides multiple mobile applications to aid in interacting with the NAS. From a remote control to a surveillance app to help view and control your home’s security camera, ASUSTOR has an app for that. For those of you that are curious about the ASUSTOR ADM operating system, you can experience all that it has to offer by going to ASUSTOR’s live demo webpage. Using ‘demo | asustor’ as the logon credentials, you can experience all that ADM has to offer without the initial investment of buying your own box. In the past, we have conducted straight file copies to and from the NAS devices. Using large single files and directories with thousands of smaller ones, we were able to get a real-world idea of read and write speeds when averaging out multiple runs. This has treated us well, and is a method still used by many, but for our past many reviews, we’ve stuck with NASPT. Additionally, Jamie used CrystalDiskMark in his look at the DS216+ so for continuity; it has been used in our evaluation of the AS6104T as well. A few years ago, Intel created its own benchmarking tool for NAS devices called NASPT. Short for NAS Performance Toolkit, NASPT is, to quote Intel, “a file system exerciser and analysis tool designed to enable direct measurement of home network attached storage (NAS) performance.” Essentially what the company did was create a tool that mimics day-to-day workloads, such as video playback, content creation and office productivity. By creating this tool, Intel has made it extremely easy on those of us tasked with benchmarking NAS devices. 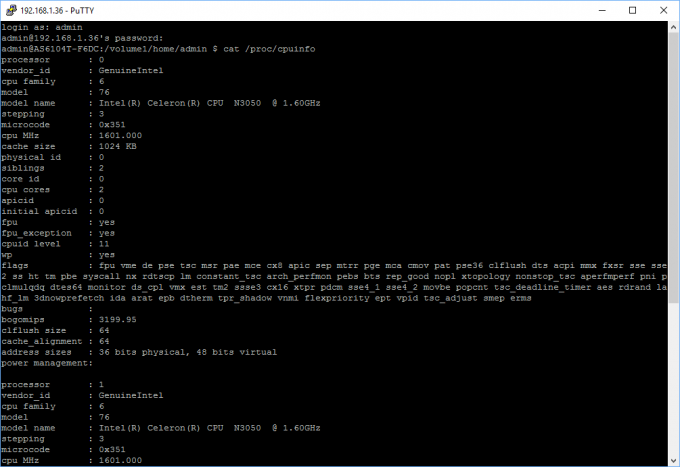 You install NASPT on a host machine (their recommended specs are 32-bit XP SP2 and 2GB of RAM), map a drive on that host that points to the NAS and decide which tests you want to run. These are the specs that I used when building out our test machine. It is admittedly getting old, but for NASPT, it serves us well in that capacity. Our test bed is a simple, everyday machine. It’s a capable PC and one that worked perfectly for the NASPT test. While getting a bit long in the tooth, we continue to use it to keep our results consistent and comparable. Our test network is a flat network consisting of discrete network cards and our switch is a Netgear ProSAFE GS724T. It should be mentioned that only RAID5 was used in the testing of the AS6104T. This is the RAID mode most likely to be used with any four bay NAS and as a result, that is what was used. Looking over the results, the AS6104T is certainly an impressive NAS. Speeds are among the highest we’ve seen on NASes that we’ve tested. The AS6104T is faster is some areas, and slower in others, when compared to the last NAS I tested, the WD DL4100. NASPT is an older tool, but still an industry standard when looking around the web at other trusted review sites. It’s for that reason that I still use it. When comparing the AS6104T to the DS216+ that we looked at back in May, the ASUSTOR NAS impresses again. Using CrystalDiskMark as the benchmark, the AS6104T scores higher in most metrics than the Synology NAS equipped with the same CPU. While not exactly an apples to apples comparison, for example the ASUSTOR has 2GB of RAM as opposed to Synology’s 1GB, the evaluation is sound when considering that for day-to-day operation, the user’s network will often be the bottleneck. Finally, the raw file copies test shows the capabilities of the AS6104T yet again. iSCSI performance is on par with other comparable NAS boxes on the market but the network share speeds are impressive. Thanks in part to Windows 10’s use of SMB3, the read and write speeds are the fastest we’ve seen to date. 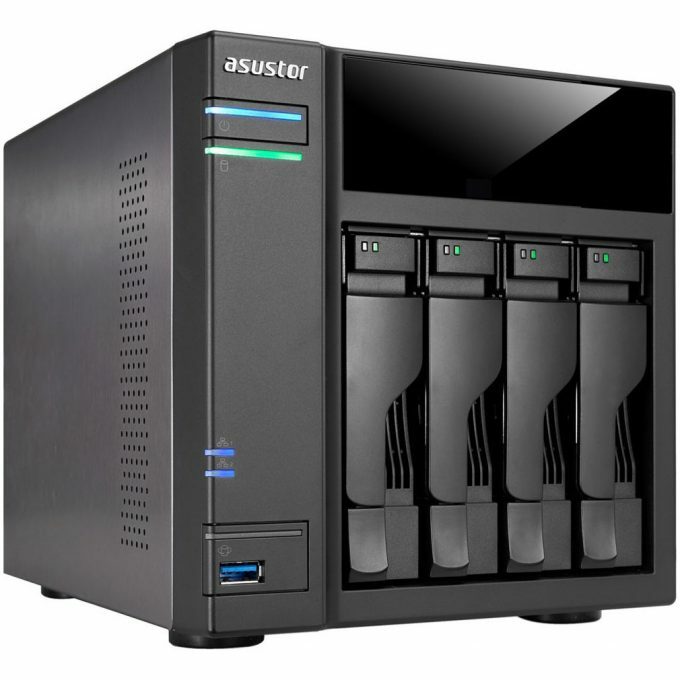 All told, the ASUSTOR AS6104T is a very capable NAS solution for home and small business use. The fact of the matter is that we as a whole are limited by the speeds offered by gigabit Ethernet. That is going to be the ceiling we smash our heads against for years to come. It’s because of that, NAS testing for pure numbers alone is a foolish endeavor. With that in mind, software is currently where the manufacturers like ASUSTOR truly shine. Give access to developers and let them decide the expandability of the platform. For example, by incorporating an app like Kodi on the AS6104T, as well as including an HDMI port, not only has ASUSTOR given users the ability to playback video and music files, but has also allowed users to serve the rest of their network from that same device. Apps like Kodi (or Plex) are the best example of what is possible through the marriage of quality hardware and smart software. It’s also a place where ASUSTOR shines. Keeping with the same hardware cadence as other NAS vendors, ASUSTOR keeps parity on the hardware front. It’s with the cultivation of its app marketplace that ASUSTOR begins to distance itself from the competition. The only other company that comes close is Synology, and still ASUSTOR beats it on the raw amount of applications available for download. It’s time that the industry adopts a new name for these devices. NAS seems so limiting. Almost insulting. Yes, you are placing disk space onto your network for others to access, but these diminutive boxes provide so much more than just capacity. The ecosystems that are contained within each vendor’s offerings provide many, many options that allow the user to tailor what is made available on their network and what is provided outside of it. The AS6104T, armed with an Intel N3050 CPU, is a very capable option for anyone looking to add both functionality and redundancy to their network. I’ve used the word “capable” quite a few times in this review. Perhaps I simply have a limited vocabulary. That’s actually pretty accurate and succinct. Regardless, that word sums up the AS6104T perfectly. It’s capable. There is simply so much you can do with it beyond simple file storage, and the trend in the NAS market to include multimedia I/O is something that cannot be overlooked. A NAS consumes less power than an HTPC yet provides a majority of what a fully realized computer can. I’ll argue with anyone that a NAS like the AS6104T can replace almost all HTPCs sitting in the entertainment centers of users today. The AS6104T earns an Editor’s Choice award for both its performance and capabilities. See, I used the word again.